24 awaiting the effect of the letter to Halley. no answer was received after a year and a half, and then, in 1732, the invention of Godfrey was laid before the Royal Society by the botanist Peter Collinson. Isaac Newton, in 1727, gave a description of a reflecting instrument to his friend Edmund Halley, who, for some reason unknown, suppressed it and it was not till after Halley's death, in 1742, that it became public. 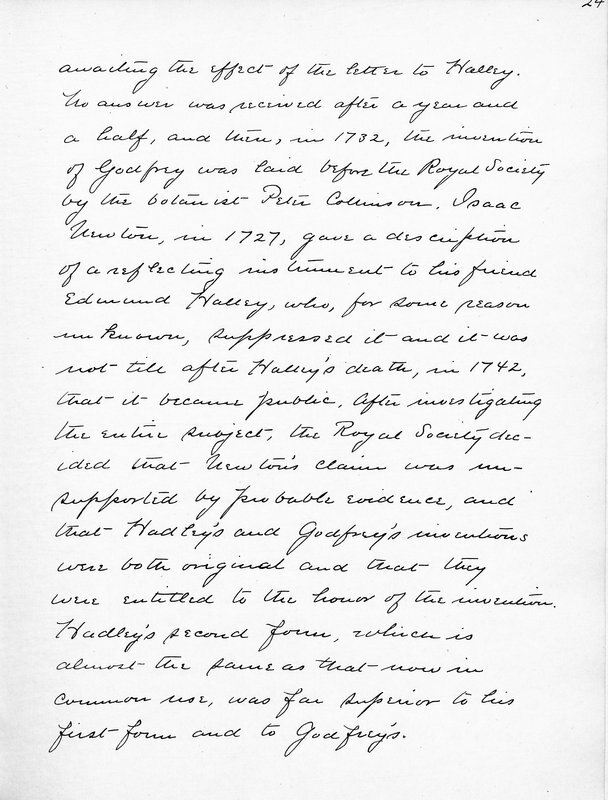 After investigating the entire subject, the Royal Society decided that Newton's claim was unsupported by probable evidence, and that Hadley's and Godfrey's inventions were both original and that they were entitled to the honor of the invention. Hadley's second form, which is almost the same as that now in common use, was far superior to his first form and to Godfrey's.